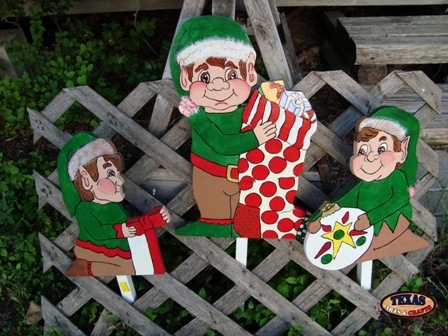 We build the Christmas Elf Set yard signs in our workshop. The elf with the package is hand painted with a green shirt with red trim, a green hat with white trim, and brown pants. The elf is holding a red and white package. The next elf is holding a red and white stocking. He is hand painted with a green shirt, a green hat with white trim, and brown pants. The last elf is the one with the white bulb. He is hand painted with a green shirt, a green hat with white trim, and brown pants. The dimensions for the elf with the package are approximately 11.50 inches tall by 10 inches wide by 1.50 inches deep. The sign has a 14 inch stake. The yard sign weighs approximately 1.75 pounds with packaging. The dimensions for the elf with the stocking are approximately 16 inches tall by 11.50 inches wide by 1.50 inches deep. The sign has a 19 inch stake. The yard sign weighs approximately 2.25 pounds with packaging. The dimensions for the elf with the white bulb are approximately 12.25 inches tall by 11 inches wide by 1.50 inches deep. The sign has a 17 inch stake. The yard sign weighs approximately 2 pounds with packaging. The signs have a combined weight of 6 pounds with packaging. For the continental U.S. shipping and handling is included in the listed price. For shipping outside the continental U.S. please contact us through our Contact Us page. 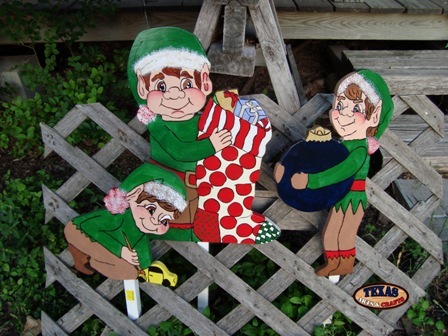 We build the Christmas Elves yard signs in our workshop. The elf painting the car is hand painted with a green shirt, a green hat with white trim, and brown pants. The elf is painting a yellow car. The next elf is holding a red and white candy cane. He is hand painted with a green shirt with white trim, a green hat with white trim, and brown pants. The last elf is the one holding a blue bulb. He is hand painted with a green shirt, a green hat with white trim, and brown pants. The dimensions for the elf painting the car are approximately 9.75 inches tall by 9 inches wide by 1.50 inches deep. The sign has a 14 inch stake. The yard sign weighs approximately 1.75 pounds with packaging. The dimensions for the elf with the candy cane are approximately 17 inches tall by 9.50 inches wide by 1.50 inches deep. The sign has a 17 inch stake. The yard sign weighs approximately 2.25 pounds with packaging. The dimensions for the elf holding a blue bulb are approximately 16 inches tall by 8 inches wide by 1.50 inches deep. The sign has a 19 inch stake. The yard sign weighs approximately 2 pounds with packaging. The signs have a combined weight of 6 pounds with packaging. For the continental U.S. shipping and handling is included in the listed price. For shipping outside the continental U.S. please contact us through our Contact Us page. 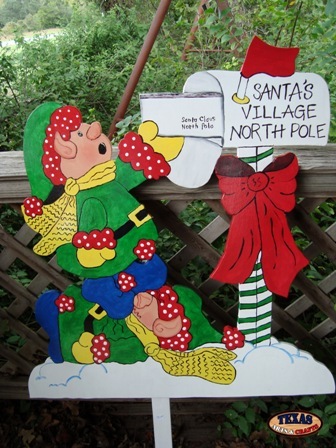 We build the Busy Christmas Elves yard signs in our workshop. The elf painting the car is hand painted with a green shirt, a green hat with white trim, and brown pants. The elf is painting a yellow car. The next elf is holding a red and white candy cane. He is hand painted with a green shirt with white trim, a green hat with white trim, and brown pants. The last elf is the one with the white bulb. He is hand painted with a green shirt, a green hat with white trim, and brown pants. The dimensions for the elf painting the car are approximately 9.75 inches tall by 9 inches wide by 1.50 inches deep. The sign has a 14 inch stake. The yard sign weighs approximately 1.75 pounds with packaging. The dimensions for the elf with the candy cane are approximately 17 inches tall by 9.50 inches wide by 1.50 inches deep. The sign has a 17 inch stake. The yard sign weighs approximately 2.25 pounds with packaging. The dimensions for the elf with the white bulb are approximately 12.25 inches tall by 11 inches wide by 1.50 inches deep. The sign has a 17 inch stake. The yard sign weighs approximately 2 pounds with packaging. The signs have a combined weight of 6 pounds with packaging. For the continental U.S. shipping and handling is included in the listed price. For shipping outside the continental U.S. please contact us through our Contact Us page. 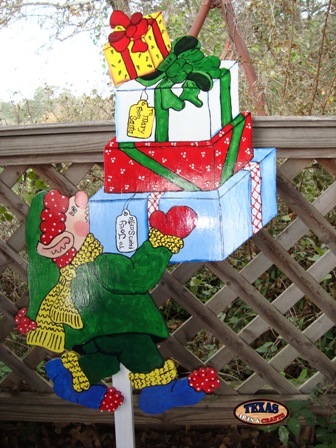 We build the Jolly Christmas Elves yard signs in our workshop.The elf painting the car is hand painted with a green shirt, a green hat with white trim, and brown pants. The elf is painting a yellow car. The next elf is holding a red and white stocking. He is hand painted with a green shirt, a green hat with white trim, and brown pants. The last elf is the one holding a blue bulb. He is hand painted with a green shirt, a green hat with white trim, and brown pants. The dimensions for the elf painting the car are approximately 9.75 inches tall by 9 inches wide by 1.50 inches deep. The sign has a 14 inch stake. The yard sign weighs approximately 1.75 pounds with packaging. The dimensions for the elf with the stocking are approximately 16 inches tall by 11.50 inches wide by 1.50 inches deep. The sign has a 19 inch stake. The yard sign weighs approximately 2.25 pounds with packaging. The dimensions for the elf holding a blue bulb are approximately 16 inches tall by 8 inches wide by 1.50 inches deep. The sign has a 19 inch stake. The yard sign weighs approximately 2 pounds with packaging. The signs have a combined weight of 6 pounds with packaging. For the continental U.S. shipping and handling is included in the listed price. For shipping outside the continental U.S. please contact us through our Contact Us page. We build the Elf Holding Blue Bulb yard sign in our workshop. 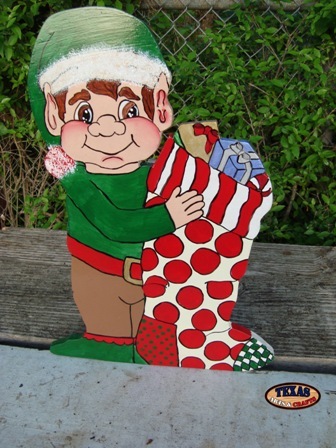 The elf is hand painted with a green shirt, a green hat with white trim, and brown pants. He is holding a blue bulb. 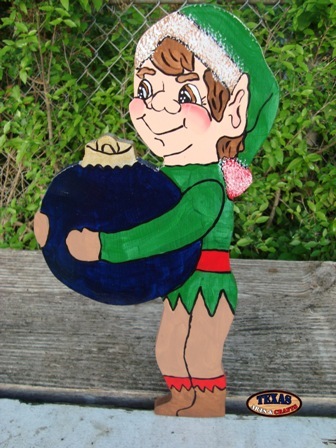 The dimensions for the elf holding blue bulb are approximately 16 inches tall by 8 inches wide by 1.50 inches deep. The sign has a 19 inch stake. The yard sign weighs approximately 2 pounds with packaging. For the continental U.S. shipping and handling is included in the listed price. For shipping outside the continental U.S. please contact us through our Contact Us page. 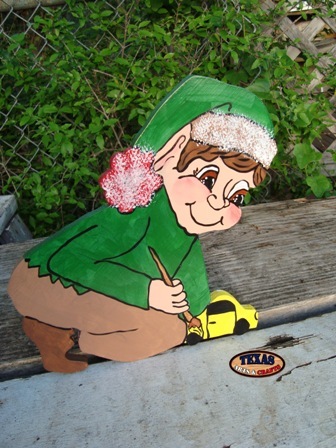 We build the Elf Painting Car yard sign in our workshop. The elf is hand painted with a green shirt, a green hat with white trim, and brown pants. The elf is painting a yellow car. The dimensions for the elf painting the car are approximately 9.75 inches tall by 9 inches wide by 1.50 inches deep. The sign has a 14 inch stake. The yard sign weighs approximately 1.75 pounds with packaging. For the continental U.S. shipping and handling is included in the listed price. For shipping outside the continental U.S. please contact us through our Contact Us page. 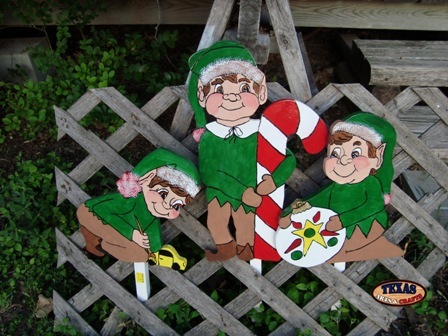 We build the Elf With Candy Cane yard sign in our workshop. The elf is hand painted with a green shirt with white trim, a green hat with white trim, and brown pants. He is holding a red and white candy cane. The dimensions for the elf with the candy cane are approximately 17 inches tall by 9.50 inches wide by 1.50 inches deep. The sign has a 17 inch stake. The yard sign weighs approximately 2.25 pounds with packaging. For the continental U.S. shipping and handling is included in the listed price. For shipping outside the continental U.S. please contact us through our Contact Us page. We build the Elf With Package yard sign in our workshop. The elf is hand painted with a green shirt with red trim, a green hat with white trim, and brown pants. The elf is holding a red and white package. The dimensions for the elf with the package are approximately 11.50 inches tall by 10 inches wide by 1.50 inches deep. The sign has a 14 inch stake. The yard sign weighs approximately 1.75 pounds with packaging. For the continental U.S. shipping and handling is included in the listed price. For shipping outside the continental U.S. please contact us through our Contact Us page. We build the Elf With Stocking yard sign in our workshop. 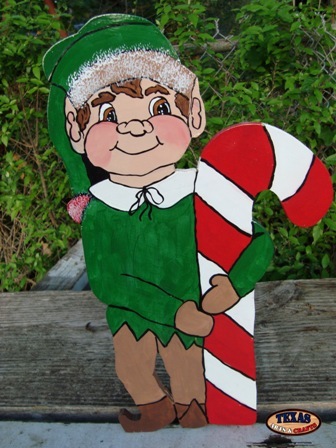 The elf is hand painted with a green shirt, a green hat with white trim, and brown pants. The stocking is painted red and white. The dimensions for the elf with the stocking are approximately 16 inches tall by 11.50 inches wide by 1.50 inches deep. The sign has a 19 inch stake. The yard sign weighs approximately 2.25 pounds with packaging. For the continental U.S. shipping and handling is included in the listed price. For shipping outside the continental U.S. please contact us through our Contact Us page. We build the Elf With White Bulb yard sign in our workshop. 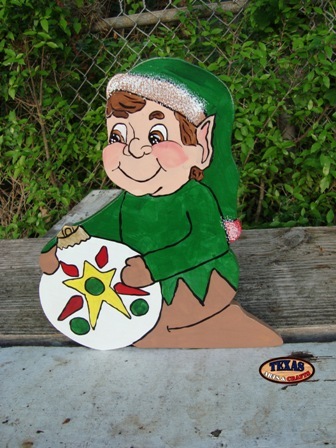 The elf is hand painted with a green shirt, a green hat with white trim, and brown pants. The bulb is painted white with decoration. The dimensions for the elf with the white bulb are approximately 12.25 inches tall by 11 inches wide by 1.50 inches deep. The sign has a 17 inch stake. The yard sign weighs approximately 2 pounds with packaging. For the continental U.S. shipping and handling is included in the listed price. For shipping outside the continental U.S. please contact us through our Contact Us page. 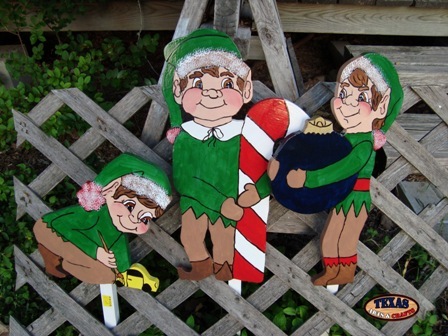 We build the Elves With Mailbox yard sign in our workshop. The elves are hand painted in a green shirt, pants, and hat with red trim. They have blue shoes, yellow mittens, and a yellow scarf. They are standing on each other checking the mail from a white mailbox. The dimensions are approximately 32 inches tall by 29 inches wide by 1.50 inches deep. The sign has a 25 inch stake. The yard sign weighs approximately 9 pounds with packaging. For the continental U.S. shipping and handling is included in the listed price. For shipping outside the continental U.S. please contact us through our Contact Us page. We build the Elf Lights yard sign in our workshop. The elf is hand painted in a green shirt, pants, and hat with red and yellow trim. The elf has blue shoes, blue mittens, and a yellow scarf. The elf is holding multi-colored Christmas lights. The dimensions are approximately 15 inches tall by 16 inches wide by 1.50 inches deep. The sign has a 12 inch stake. The yard sign weighs approximately 5 pounds with packaging. For the continental U.S. shipping and handling is included in the listed price. For shipping outside the continental U.S. please contact us through our Contact Us page. We build the Elf Presents yard sign in our workshop. 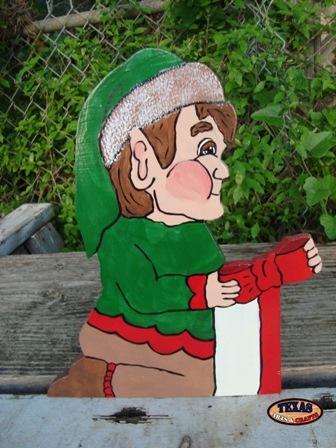 The elf is hand painted in a green shirt, pants, and hat with green and red trim. The elf has blue shoes, red mittens, and a yellow scarf. The elf is carrying a stack of presents. The dimensions are approximately 32 inches tall by 21 inches wide by 1.50 inches deep. The sign has a 25.50 inch stake. The yard sign weighs approximately 9 pounds with packaging. For the continental U.S. shipping and handling is included in the listed price. For shipping outside the continental U.S. please contact us through our Contact Us page. 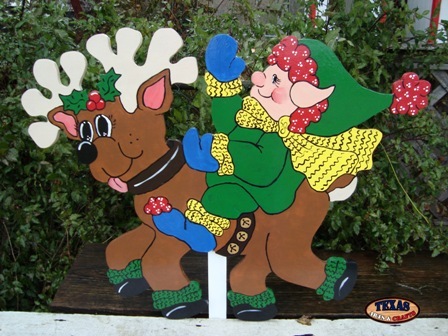 We build the Elf Reindeer yard sign in our workshop. 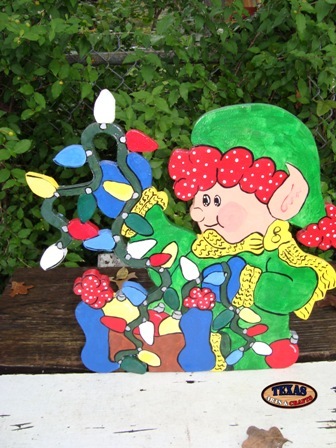 The elf is hand painted in a green shirt, pants, and hat with red and yellow trim. The elf has blue shoes, blue mittens, and a yellow scarf. The elf is riding on a brown reindeer. The dimensions are approximately 23 inches tall by 29.50 inches wide by 1.50 inches deep. The sign has a 22 inch stake. The yard sign weighs approximately 9 pounds with packaging. For the continental U.S. shipping and handling is included in the listed price. For shipping outside the continental U.S. please contact us through our Contact Us page. 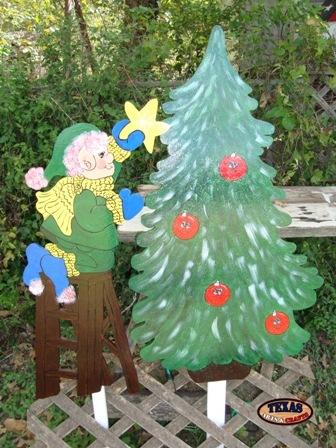 We build the Christmas Elf With Tree yard sign in our workshop. The elf is hand painted in a green shirt, pants, and hat with yellow scarf and blue stockings. The elf is on a brown ladder hanging the yellow star on the Christmas Tree. The Christmas tree is hand painted green with red bulbs. The dimensions for the elf on the ladder are approximately 33 inches tall by 16 inches wide by 1.50 inches deep. The sign has a 30 inch stake. The dimensions for the Christmas Tree are approximately 38.50 inches tall by 22 inches wide by 1.50 inches deep. The sign has a 31 inch stake. The yard signs have a combined weight of approximately 15 pounds with packaging. For the continental U.S. shipping and handling is included in the listed price. For shipping outside the continental U.S. please contact us through our Contact Us page.